SIMPLE AND ELEGANT: Add Elegance to your bathroom with the classy ceramic bath set from Blissful Living. Simple enough to men, women, boys or girls and Elegant enough for yourself or to give as a gift to a friend. GREAT VALUE: Sold at an affordable price without compromising quality our bath sets can be bought and used by anyone. 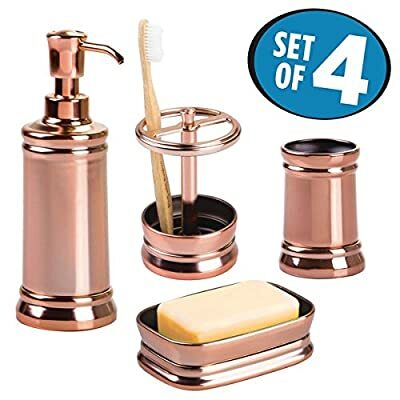 ONE STOP SHOP: Includes everything you would need for your bathroom this 4-piece set has a Tumbler, Soap dish, Soap Dispenser and Toothbrush holder. 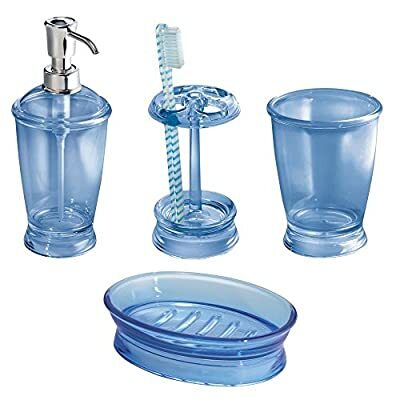 COMPLETE BATH SET: Comes with a Hand Soap Dispenser, Toothbrush Holder, Soap Dish and Tumbler. 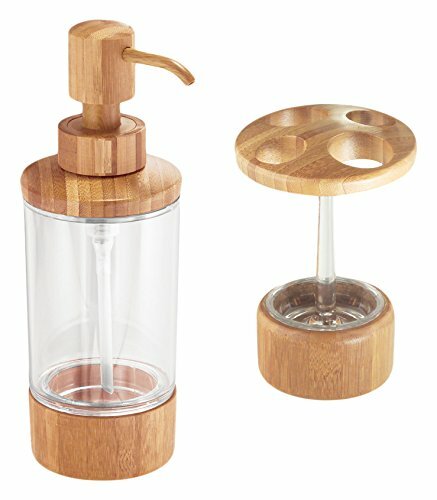 CRAFTED QUALITY: The pump dispenser is designed not to clog or break. 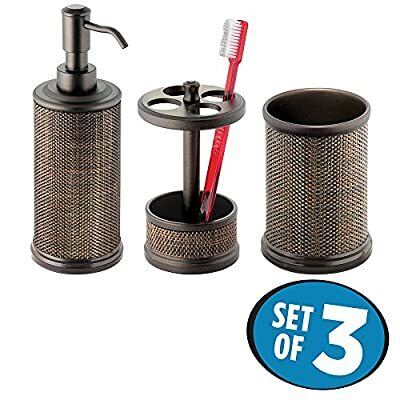 The holder is big enough for 4 PCS toothbrushes.4 PCS with LE BAIN Steel Decoration. SPA LIKE BEAUTY: These stunning pieces provide a luxurious feel and aesthetic, yet they remain affordable and practical. Functional as they are, they will add a beautiful, elegant touch to your home’s decor. 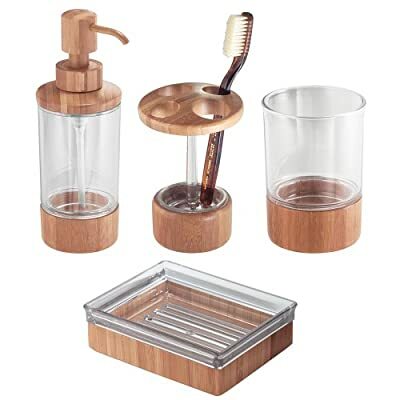 Bathroom Amenity Accessory Set for Sink Countertop, included a Dispenser, Soap Tray, Toothbrush Holder and Tumbler. Cast Out of Sand Resin, for earthy deco ambient while provide durability for daily use. Three Different Designs, Comprise of Round, Triangle and Square choices for matching bathroom style accordingly. 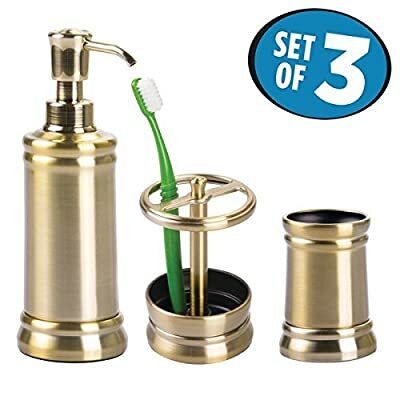 3 Pieces Bathroom Accessories Sets – This luxury gold bathroom essentials accessory set includes: 1 x bathroom soap dispense with brushed stainless steel pump, 1 x bathroom soap dish, 1 x bathroom tumbler cup. Have easy access to your toiletries with just a simple grab with everything organized. 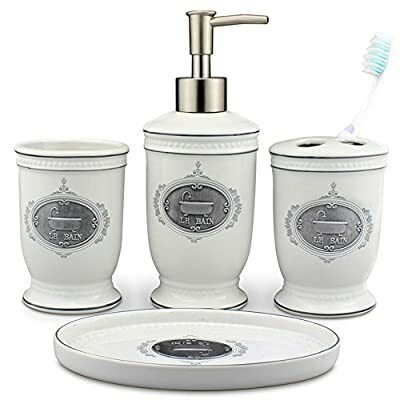 Add a classic and decorative touch to your bathroom with our gorgeous 3-piece bathroom set. Timeless Elegance and Luxury Design – Our bathroom soap dispenser set made of crackle glass with an antique amber finish and black detailing. Its simple design adds a timeless look to any washroom, giving it just the right amount of luxury. 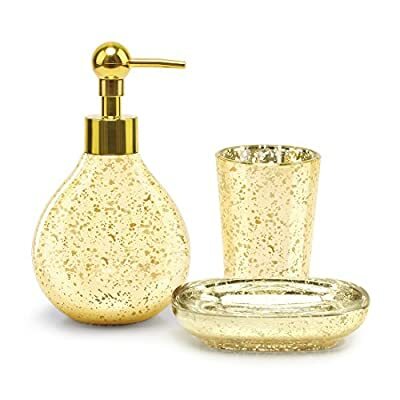 Whatever your bathroom color scheme, this golden bathroom set will blend in perfectly and definitely impress your guests. Quality and Craftsmanship You Can Trust – Made of quality acrylic, no need to worry about any of the products chipping, breaking or fading. 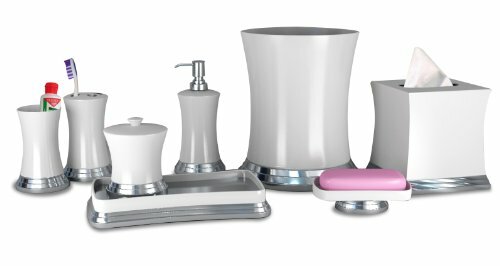 Whether you are attending a housewarming or Christmas party, this luxury bathroom accessory set makes a great gift for family, friends, and coworkers; it’s perfect for remodelers looking to upgrade the bathroom in their home or apartment. 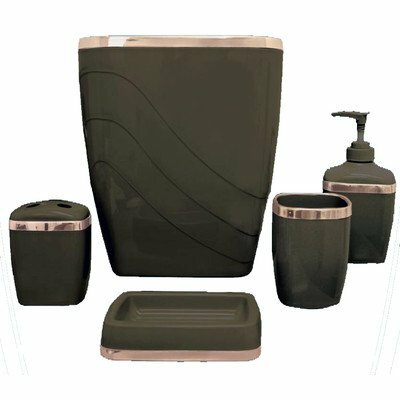 WPM 4 Piece Bathroom Accessory Set. 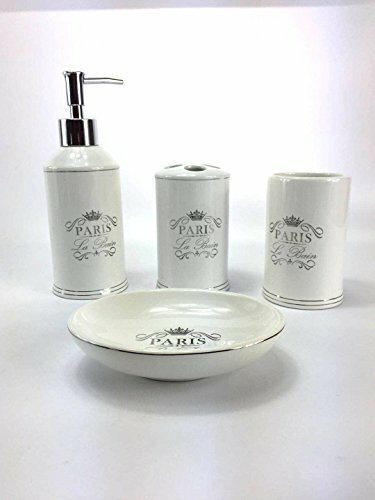 White Classic French Provincial Bath Gift Set includes liquid soap/lotion dispenser, toothbrush holder, tumbler, and soap dish. 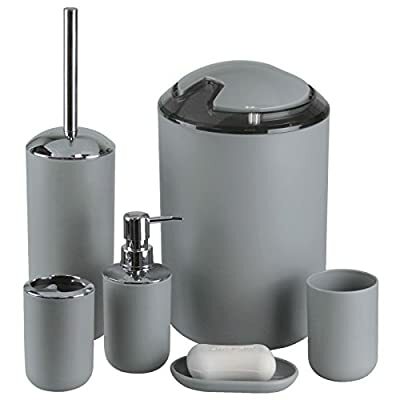 4-PIECE BATHROOM ESSENTIALS: Upgrade the look of your bathroom with this modern and chic 4pc set, including a toothbrush holder, tumbler/rinsing cup, soap dish and dispenser pump. 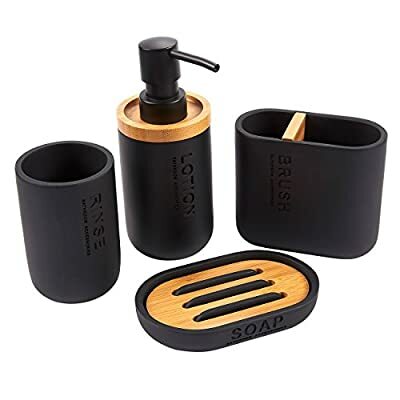 VERSATILE DECOR: With its use of matte black resin accented with wood, Juvale’s bath accessories set is an excellent fit for most types of bathroom decor. 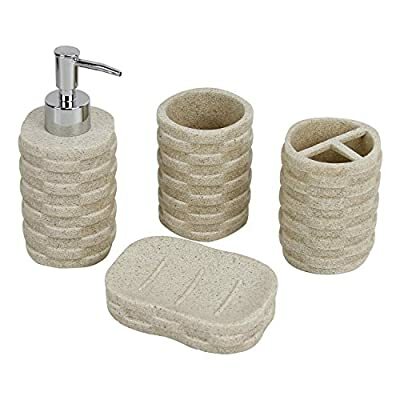 PERFECT FOR ALL BATHROOMS: This bathroom accessory set is perfect for bathrooms of all varieties, whether it’s your personal bathroom, a guest bathroom, a bathroom at a bed and breakfast, rental property, spa, etc. 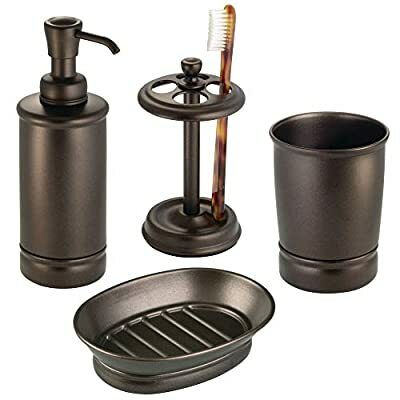 ★ bathroom accessoriesThe Set Includes:1 Tumbler, 1 Toothbrush Holder, 1 Lotion Dispenser, 1 Soap Dish, 1 Bathroom Trash Can And 1 Toilet Brush With Holder. ★Function: Decorate Your Bathroom, They Could Assist In Protecting Your Surface, Keep Your Bathroom Clean, Tidy And Orderly. KLEO brings Hand-crafted luxury to redefine your home decor. 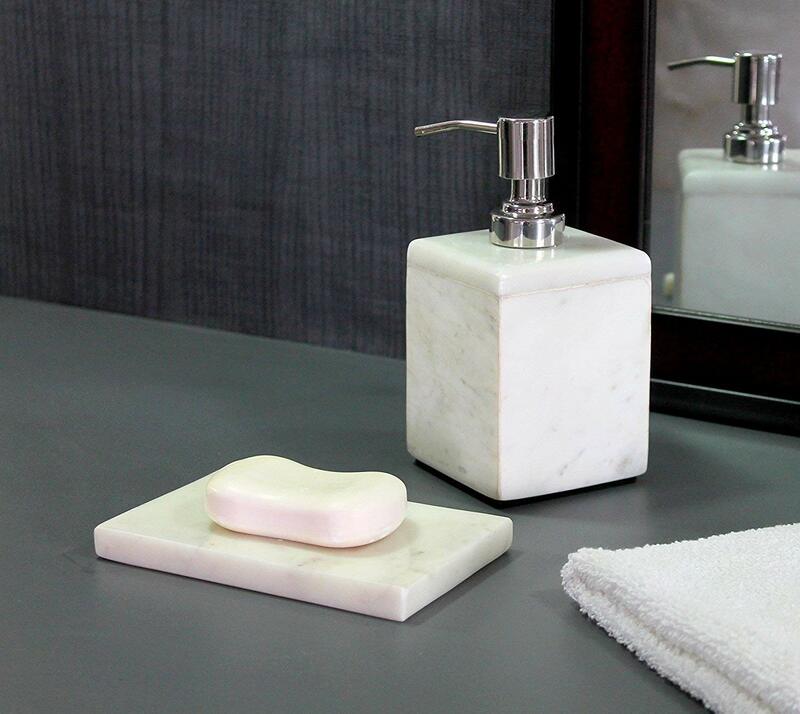 Add sheen and class to your bathroom with this artistic piece made out of Marble Stone in White color. 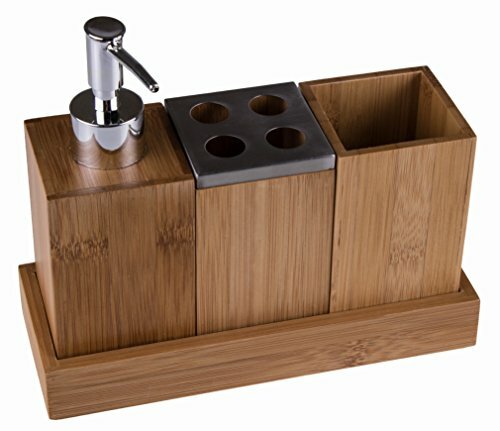 KLEO Soap Dispensers are fitted With High Quality Stainless Steel Pumps. Because of Soap and water hardness, Steel pumps *may* get stained over time. 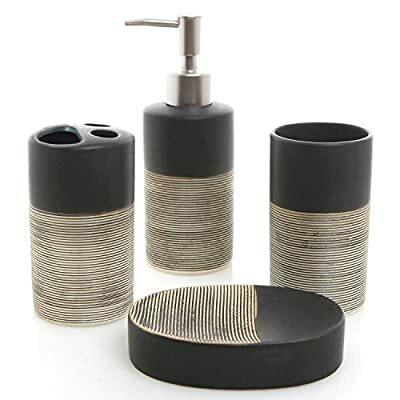 A gorgeous 4-piece bathroom counter accessories set made of ceramic and featuring a combination of black and beige finishes. 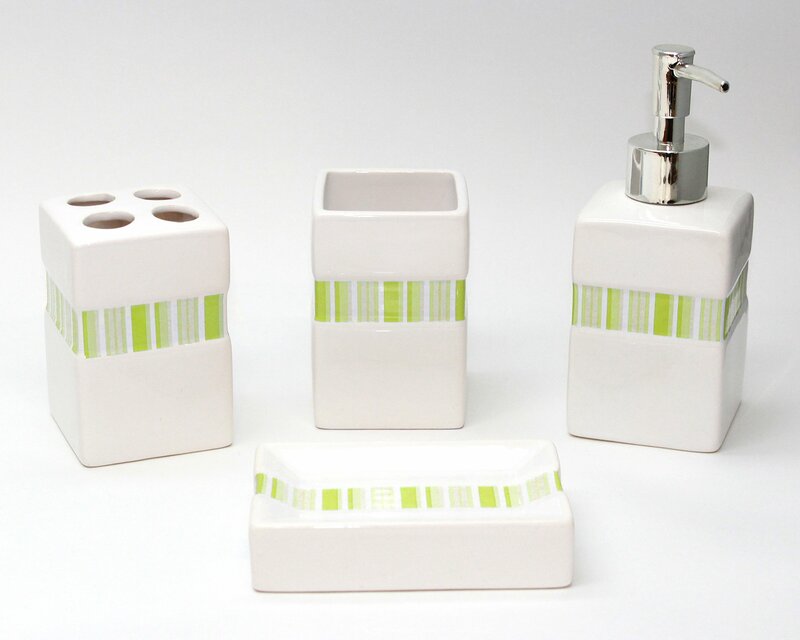 This stylish set comes with 1 toothbrush holder, 1 tumbler, 1 pump-top hand soap dispenser, and 1 soap dish. 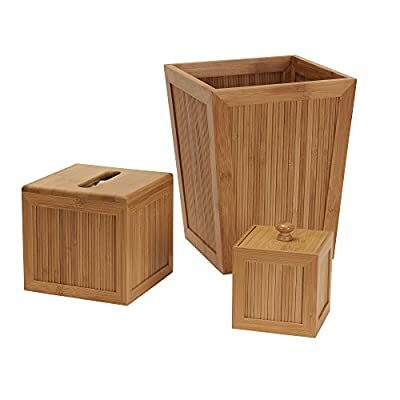 Perfect for storing your toiletries and adding style to your bathroom counter. 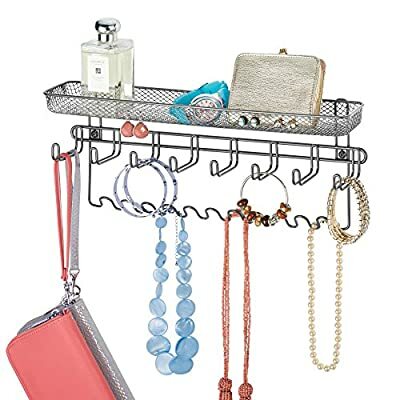 Toothbrush holder has two sections for storing toothbrushes, toothpaste, makeup brushes and more! 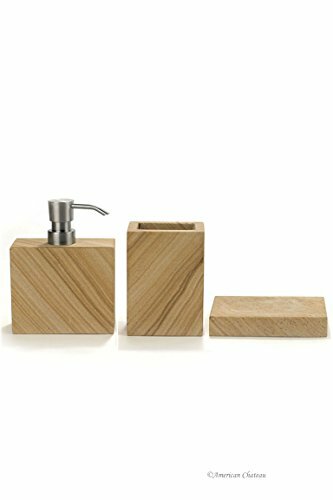 HIGH QUALITY: 3 Piece bathroom accessory set made of high quality stone. Quality PUMP: Stainless Steel look pump with durable plastic mechanism. RENOVATE YOUR BATHROOM: Our beautiful 4-piece bathroom collection gives your bathroom an all-new look that’s hard to miss; the beautiful modern design is built with durable plastic to last long and look good. 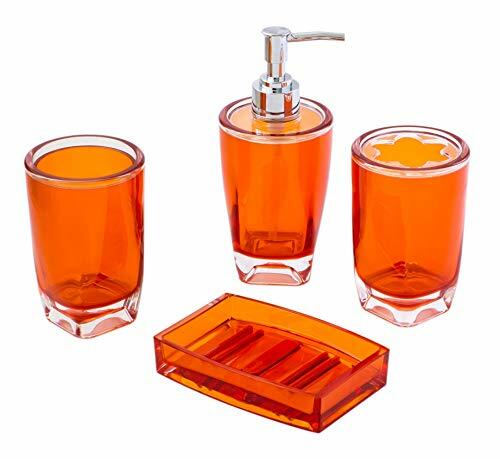 A COMPLETE SET: This essential set contains all you need; 1 soap dish, 1 liquid soap dispenser with pump, 1 flower shaped toothbrush holder and 1 tumbler; makes a great housewarming gift. 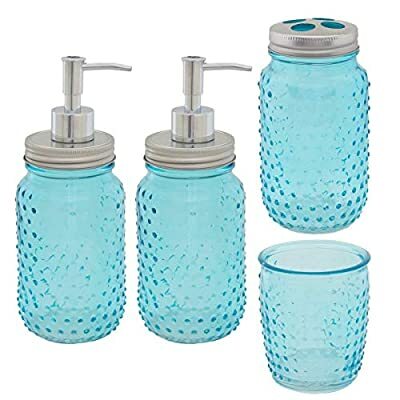 A GLASSY LOOK: Made of durable acrylic, this bathroom collection looks just like glass, but is much tougher; it takes falls and bumps without breaking and is easy to clean; just rinse it under warm water.